Autumn mornings are famous around here for their mist. Once the sun comes out, it burns off quickly. There is something very soft and beautiful about the lake when it is shrouded in mist in the early morning. These mallards were gliding in their surreal world when Taffy and I went for a walk. You can just barely spot them, in the bottom left of the picture, along with the ghostly birch trees along the Port Cunnington Road. Labels: Bondi Village Resort. Autumn Photo opportunities. Sunday, the Muskoka Agility Dogs descended upon our indoor riding arena for a seminar about Strengthening and conditioning. Tania Costa took the group through a series of exercises, including analysis of gait and posture; strains produced by various agility apparatus; basic anatomy; and conditioning and strengthening techniques. It was a fascinating 'closer look' at our best pals. Tania is a Certified Canine Rehabilitation Practioner, among a long list of other credentials. She is the owner of Canine Wellness Centre Inc. .
She is passionate about the recongition and treatment prevention of injuries in athletic dogs, and believes that core strengthening programs can go a long way to help keep these dogs Game Ready. I found it fascinating to watch the cross-over between this work and what I do with the horses when we are conditioning them for competition. I smiled at some of the similarities: Horses do Carrot Stretches, where they reach around for a carrot treat in order to stretch out certain muscle groups. Tania's dogs do Biscuit Stretches. Then there's the apparatus -- out come the standard Pilates Exercise balls, but along with them are Dog Specific items. Peanuts (which are like balls, only longer, to accommodate a dog lying on top of them); Donuts to balance on not to eat; wobble boards. Like anything, you need to be using the gear properly. While the dogs learn to balance they are using all their core muscles, but there is also an opportunity for the handler to position the limbs to ensure correct posture. Why would that matter? Dogs running through weave poles, jumping hurdles, or tackling the A-frame in a Trial put tremendous strain on muscles. Couple that with poor posture, and it is a recipe for injury. The equipment must fit the dog. From tiny little Bandit and Reese to the 'big boys' like Hogan and Harley, and everyone in between, Tania was vigilant to ensure the right size equipment and the correct techniques. This was an excellent learning experience for everyone, two-legged or four-legged, and just one more way to have a whole lot of fun with your dog. Come winter, when the weather is not so much fun for evening walkies, there will be a whole bunch of M.A.D. dogs in the comfort of the living room, balancing on peanuts and wobble boards. And perhaps the occasional handler as well. After all, the handlers need to be able to keep up with their dogs! Labels: Tania Costa. Canine Wellness Centre. Muskoka Agility Dogs. Bondi Village Resort. We are Game Ready for the Trick or Treat invasion. Not that we get a big invasion out here -- but it's always fun to see the kids and costumes that do turn up! This will be Taffy's first Hallowe'en. That's quite an experience for a young dog -- after all, how often do Darth Vader, Pirates, Princesses, Hobos and Rednecks all show up at our door in the same evening? Get a cup of coffee, and pull up a chair. Here’s a great tale, a rambling saga full of dastardly deeds, swashing, buckling, loyalty, treachery, sword fights, madness and Viking treasure. The publications are old, but the tale is older. I have no idea if it is true. 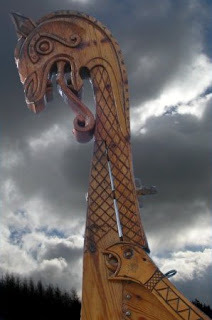 The Vikings were noted for their exploration as well as for their recording of old sagas. It’s possible... parts of it are pretty sketchy... but I present it with the warning that if the Viking treasure is truly here, somewhere on the shores of Lake of Bays, it is buried deep indeed. ‘In the early 11th century, Ronald Amundsen sailed from Ulvik in Norway on an exploring expedition to that part of the North-eastern coast of Labrador which was known to them as Vinland. It is recorded that he had, besides his own long ship, two others of 80 oars, each command by his Lieutenants Rolf Ericson and Valdemar Holmagang. The latter was a swarthy individual of fiery temperament and moody disposition but a renowned fighter amongst a race of fighters. After sundry adventures which have no bearing upon this part of the story they arrived upon the coast of Labrador where they traded all winter with fair profits to themselves. The entire crew being in good health and desirous of seeking further adventures, Ronald decided to explore the St. Lawrence River and to push on westward to Cathay (China), which was e4ven then known to the Europeans through the trading caravans which took rich cargoes of silks and other Asiatic commodities to Europe. 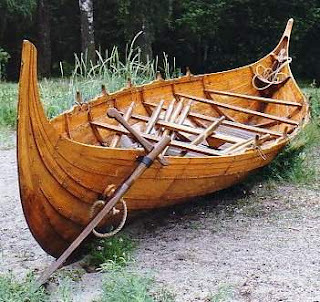 The expedition was set for the spring of the year after the breaking of the ice, but before it could be taken in hand certain other Viking ships arrived in Norway bearing tidings of internal troubles in that country which made it imperative for Ronald Amundsen to return. Placing the care of the expedition in the hands of Rolf Ericson and giving him Valdemar Holmgang as a second in command (though with many misgivings which were later justified) her directed him to seek the empire of Cathay and to give to its empower the many and beautiful gifts which he was sending. The expedition progressed without hindrance until it came to the Niagara Falls which was at that time unknown to them. Here the first trouble arose. It was at once apparent that the long ships could not be taken around the Falls. Ericson, being of an adventurous spirit and determined to carry out the order his Chief, decided to build small boats above the Falls and to continue the voyage westwards. This step was bitterly opposed by Holmgang and a certain part of the crew. These malcontents wished to return at once. They were, however, outnumbered by the better element and were forced to sullen compliance. The ships, five in all, were built. Ericson had to weaken his loyal force by detaching part of them to act as guard to the ships below the Falls. He knew full well that if he left the dissatisfied members in charge they would once desert and leave him without means of return. Lake Erie was crossed without adventure, but on reaching the narrows at a point which is known to us as Sault Ste. Marie, Indians were encountered who attacked the ships. In the original narrative many heroic deeds are recorded and the Indians being quite unfamiliar with armour were driven off; being quite afraid to again attack men whose “skin” neither arrow, spear or knife could penetrate. Dissatisfaction amongst part of the crew continued and was fomented on all occasions by Valdemar Holmgang who was showing signs of mental derangement. 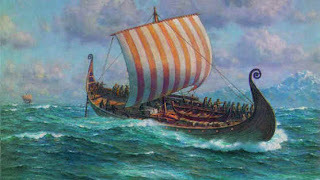 Ericson, to protect his loyal men form their own comrades, was forced to place them in two of the ships while the disloyal element were contained in the other three. Shortly after leaving the Sault St. Marie one of the ships with the mutinous element on board disappeared. It is supposed that they attempted to return to Niagara Falls although no record of their arrival is noted. We may suppose that if they did arrive that they were slain by their comrades who were watching the long ships. It was no early in the fall and the autumn gales were beginning to blow on Lake Huron. Insubordination was rife among Holmgang’s followers and one night two ships drew off and after defying Ericson, informed him that they were returning at once. 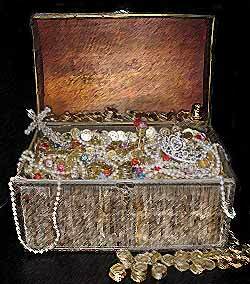 A large part of treasure was on board the ships with the mutineers. Ericson and his followers continued their voyage westward and pass out of this story. It may, however, be said that they probably reached the Pacific Coast as there has recently been discovered a giant boulder covered with Runic inscriptions detailing the story of their expedition. There is no doubt that Holmgang was no violently insane. He conceived the idea of taking a short cut back to the Labrador coast by sailing in a north-eastern direction. Maybe the idea of evading the guard at Niagara Falls had something to do with this. 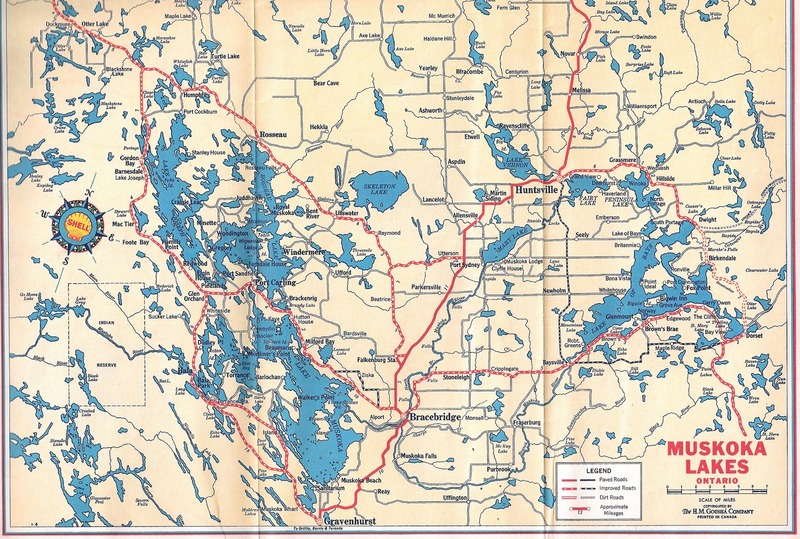 In any event, he reached Georgian Bay and by some chance or mischance he entered the mouth of the Muskoka River and continuing up he eventually reached what are now known as Fairy Lake and Peninsula Lake. 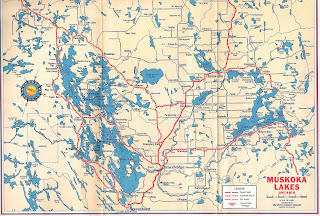 He crossed the portage and entered the Lake of Bays. It must not be thought that they came through these voyages scatheless: in Georgian Bay one of the boats was wrecked and the survivors were heartlessly abandoned on those desolate shores. The remnant of ten men and the treasure to which they had clung were all that reached the Lake of Bays. Here on this little known northern lake there took place a series of as coldly calculated crimes; planned by the cunning brain of a madman; as are scarcely equalled outside the annals of the pirates and buccaneers who roamed the South Seas many generations later. That Holmgang was criminally insane at the time there is no doubt and that he conceived the idea of destroying his followers and keeping the treasure for himself is also equally certain. Why his men did not destroy him is hard to understand, but probably that superstition in regards to the insane, which seems to be ingrained in primitive peoples the world over, was strong in them. His following of nine was soon to be reduced again. Two of his who had fallen sick he deliberately abandoned, knowing that they would fall into the hands of the Indians as indeed they quickly did. Their screams of agony as they were tortured that night were plainly heard by their comrades who were camped upon a hill to wind-ward. After this his men arose against him, but with the fury of the insane he slew four of them and the remaining three threw down their arms and continued to follow him. 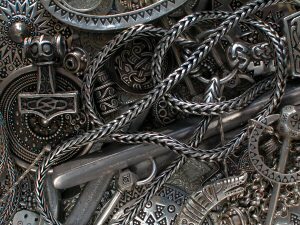 The chest in which the treasure was contained had become increasingly burdensome to carry, and now with the party reduced to three men and Holmgang himself, it was found to be impossible to transport it further, and so plans made to bury it. But Holmgang decided that dead men tell no tales, and therefore that no one should remain alive to relate where the treasure was hidden, he planned to murder the remaining three. In his insane ravings he must have made known his intention to his followers and this knave instead of warning his companions, planned to destroy Holmgang but only after Holmgang had killed the others. As described in the original document the place of the crime could scarcely have been more fitting. Presently the low hanging branches are pushed aside and four figures carrying with them the treasure chest glide into sight. A hole is hastily dug, with their swords, and though it soon large enough to contain the chest, Holmgang always urged his men to make it longer and deeper, nor with the exception of one man did they suspect that they were digging their own grave. Holmgang sprang from the hole, and with the first blow of his sword killed one of the diggers. So powerful was the blow that the man’s head was clave in twain and the blade became fastened in the steel gorget which he wore around his neck. This gave the remaining two time to scramble from the hole. The survivor as related by himself stole behind a tree to await the outcome of the fight. His companion and Holmgang sprang at each other cutting and thrusting with their swords. Wounds were given and received and blood flowed until the ground was slippery under foot. But in the madman’s strength prevailed and with a final thrust through the throat he destroyed his opponent. As he stood there watching the dying struggles of his victim, there crept upon from behind a nearby tree the figure of the remaining man. Closer and closer to his chief, who, spent with battle and wounds heard nothing, came this inhuman wretch and with one deadly stroke of his knife, ended the life of the lunatic Valdemar Holmgang. How he dragged the bodies to the hole and buried them with the treasure chest; how he feigned insanity to the Indians who fed and clothed him, how he worked his way south to Lake Ontario and then down the St. Lawrence until at last he came in contact with his own people is all narrated at length. Labels: vikings. Lake of Bays. Bondi Village. Lumina Resort. Rolf Ericson. Treasure. Muskoka. About a month or so back, big yellow trucks came by and chewed up our pavement. We joked about how that's what happens when you don't pay the taxes -- they come and take back the road. They certainly took it back -- lowering it several inches and grinding up the asphalt surface to leave us bumping along over a pretty rough base. We knew that wouldn't last, and sure enough yesterday the big yellow trucks were back. Lots of flashing lights. Men walking about with marking paint and line tapes. Road sweepers. Small trucks full of supervisors. And the piece de resistance, the asphalt truck itself. It's neat to watch, as it simply pours out a new road. In its wake, a roller scrambles back and forth, putting finishing touches on the surface. There was a bit of a delay while the trucks waited for the supply vehicles to bring them the asphalt -- it comes from Huntsville and Bracebridge and they hadn't timed it quite to perfection. Now we have a lovely new bit of paving right to our door. Smooth it is... very smooth! That noise you hear in the background? That's us, cheering for David. His graduation ceremony took place on Tuesday at Georgian College, Barrie. He graduated with honours in the Architect Technology course, and is now the "go-to" guy when you need to design and build. Which will come in handy here at Bondi! This is the first time this particular course has been offered at Georgian. We're very proud of him, of course. And since he cleans up so nicely, we wanted to share these pictures! Labels: Georgian College. Bondi Village. 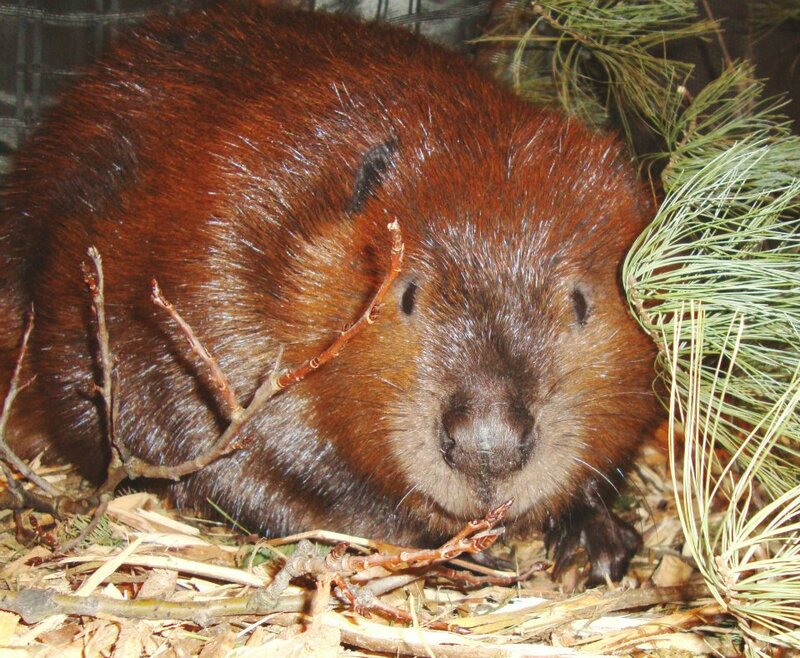 Jody, from the Muskoka Wildlife Centre, writes with sad news. "Our big beautiful boy beaver Woodrow (a.k.a. Woody) succumbed to a brain tumor a few days ago. What we originally thought was a sinus infection failed to improve with treatment. We took our buddy to Guelph for an MRI and that is when we learned that he had an inoperable tumor inside his head. Every one of our dedicated and caring staff were devastated at the news, as Woody was truly our centre’s biggest superstar. He starred in numerous t.v. 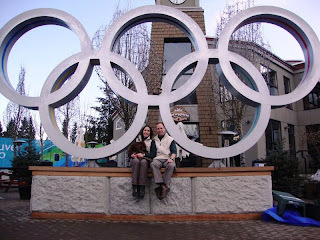 commercials and programs, on the silver screen and even made appearances in Whistler during the Olympics. He travelled all over Ontario helping us to teach people about beavers and how to live harmoniously with his industrious kind. He was a gentle, loving and often bratty guy, who reminded anyone who knew him of a needy and sometimes temperamental toddler. He has left an enormous hole here at the centre and in our hearts. We know it’s not right to have favorites when caring for creatures here at the centre but in all honesty he was just that. We do get some comfort from knowing that Woody would never have survived more than a couple of days in the wild after his parents were killed and he sustained a skull fracture that cost him his teeth as a tiny baby. He had 7 wonderful years here at the centre in which he was showered with much love and attention. His last days consisted of visits from each and every staff member (and even several past staff members who came back to say goodbye). They gave him loads of his favorite treats, took him for several dips in the pond and gave him more hugs than any beaver has ever received. Woody touched us all in a way we never thought a rodent could." Woodrow was "our" beaver -- Bondi Village sponsored him, and we were proud to do so in honour of our own wild beavers living down at Damalot and all their wild kin. Woody was the best ambassador for Canada -- he educated thousands of people about beavers, about wildlife, about the importance of sharing our planet with others and caring for it because of those others as well as ourselves. 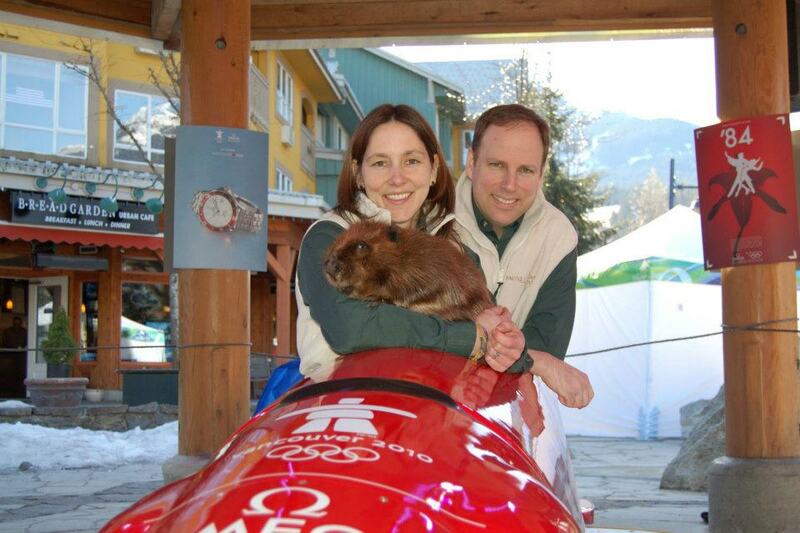 He remains the only beaver we know who has ridden in a bobsled at the Olympics, and starred in a movie, and been the guest of honour at the Trappers' Convention and befriended countless children through the Centre's great Outreach program and who loved to eat bananas. Thanks for sharing the wonder with us, Woodrow. Thanks to the Muskoka Wildlife Centre for the amazing, caring work you do with all the animals, and a special hug to you for the care you gave our buddy Woody. Swim free, Woodrow. Gnaw down some of those trees at the water's edge. Build a dam, and a lodge up there in Heaven's ponds -- flood a little bit of Paradise. That's what beavers do. Labels: Muskoka Wildlife Centre. Bondi Village Resort. Beaver. 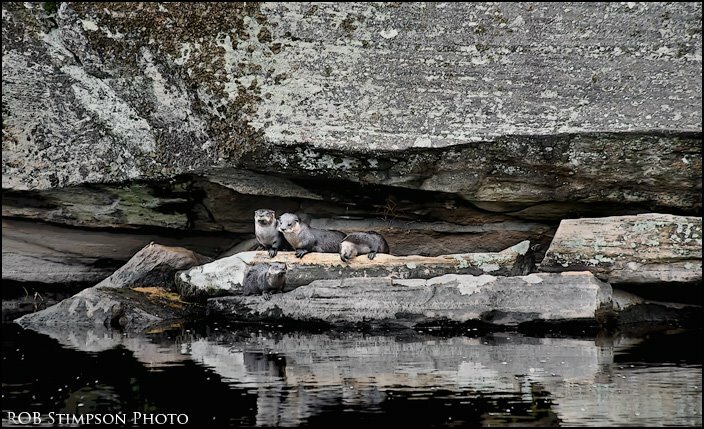 A friend of mine, Rob Stimpson, snapped this photo along Opeongo Lake Road in Algonquin Park of a family of river otters. On the Thanksgiving weekend, the Park was so busy there was consideration given to closing the gates -- they were over capacity. Trails were jammed up with people, and while the views are always wonderful and the fall colours gorgeous the wildlife spotting suffers when there are too many people out there. Rob is famous for his stunning photography. Thanks for letting us post this one here to share! Labels: River otters. Lake of Bays. Rob Stimpson photography. Bondi Village Resort. He's got about 30,000 quills. He can't 'throw' them, but if you get close enough, they will stick into you anchored nicely by the tiny barbs at the end of the hollow quills. The second largest rodent in North America (after the Beaver) and the third largest in the world, porcupines are quite astounding. The quills protect them from most enemies, so they are calm and mostly unruffled -- leave them be and they will return the favour. They are not popular when they eat the outhouse, or the canoe paddle, or even the car brake lines in their endless quest for something salty. 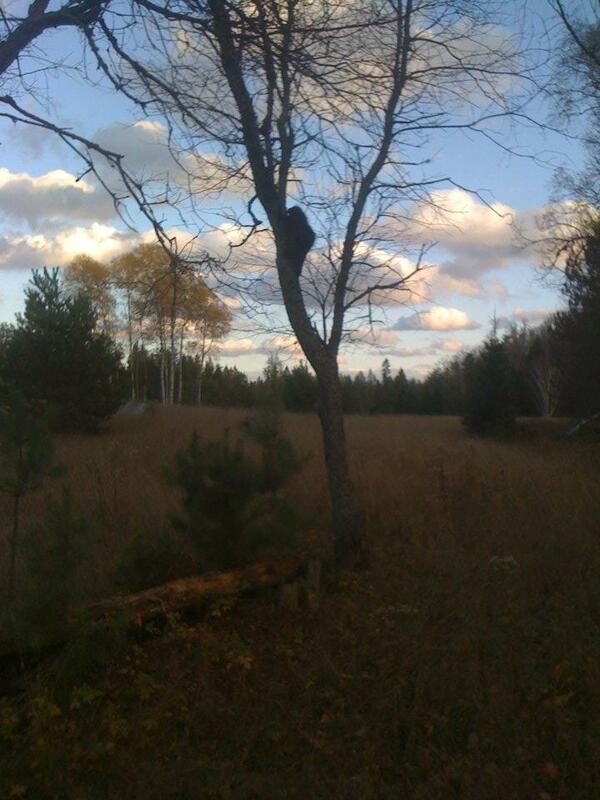 Meredith sent us this picture, taken in the back fields. She tells us she has never been that close to a porcupine before. And there was only one. Although, should you find a group of them, the correct term to describe that is a Prickle. Labels: porcupine. Bondi Village. Lake of Bays. At the Muskoka Heritage Foundation AGM on Saturday, awards were presented in a number of categories to celebrate those who steward and save our heritage in many different ways. Lake of Bays showed quite well -- the Sild's, who live on Menominee Lake near Baysville, were recognized for their many years of outstanding stewardship on their land. 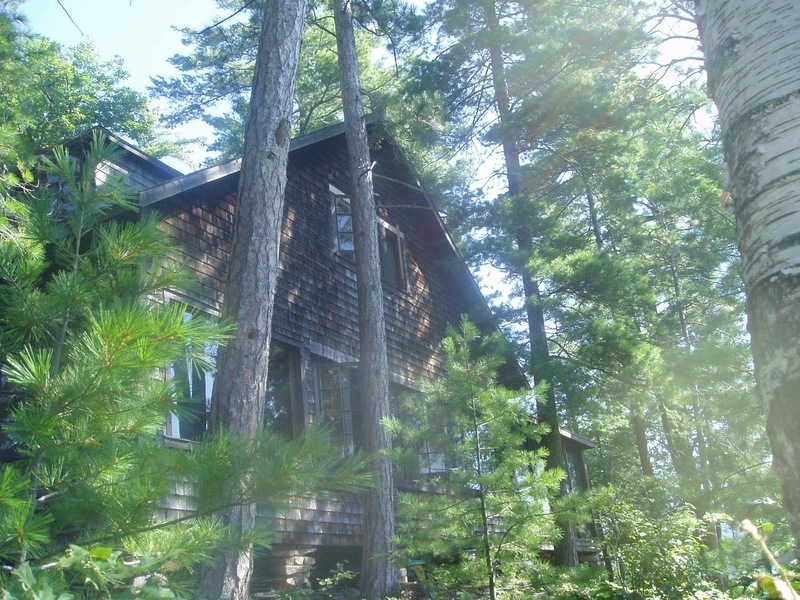 Sunset Cottage, on Rebecca Lake, and the Tea Room on Raynor Island were both recognized for their wonderful histories and the efforts their proud owners have made to preserve them. Sunset Cottage, built in 1915, has such delightful features as the hand-carved mantelpiece that was crafted by the owner while on his honeymoon there. It reads "Chop your own Wood: it will warm you Twice." The cottage is located so the summer solstice sends its rays straight through the cottage and into the back yard. It's a joyous, beautiful, peaceful place. The Tea Room got going during the steamship era when Margaret Spaulding built the structure in 1911 and operated it for many years, providing afternoon tea to the guests at the area resorts such as the WaWa, Bigwin, Britannia. Someone (or a group of someones more likely) slogged a grand piano up to the cottage. It weighs in at about 800 pounds, and given that there was never anything than a rough twisty walking path up from the dock, it must have been a tremendous accomplishment just to get it there. It won't leave anytime soon -- getting it back to the dock would be just too difficult. Richard Tatley was honoured (and surprised, god bless him) to receive the Robert J. Boyer award honouring individuals who demonstrate significant commitment to the cultural and historical heritage of Muskoka. The award is named after Bob Boyer, a local historian with a life-long commitment to the unique cultural heritage of Muskoka, and was created through the generosity of Ms. Vicki Billingsley, Mr. Boyer's daughter. Mr. Boyer was a politician, an author, a publisher, and a tireless promoter of Muskoka to the rest of the world. He wrote the quintessential book of Bracebridge's history, A Good Town Grew Here, and he was instrumental in the restoration of Woodchester Villa. For a time, Mr. Boyer acted as a trustee for the Royal Ontario Museum. 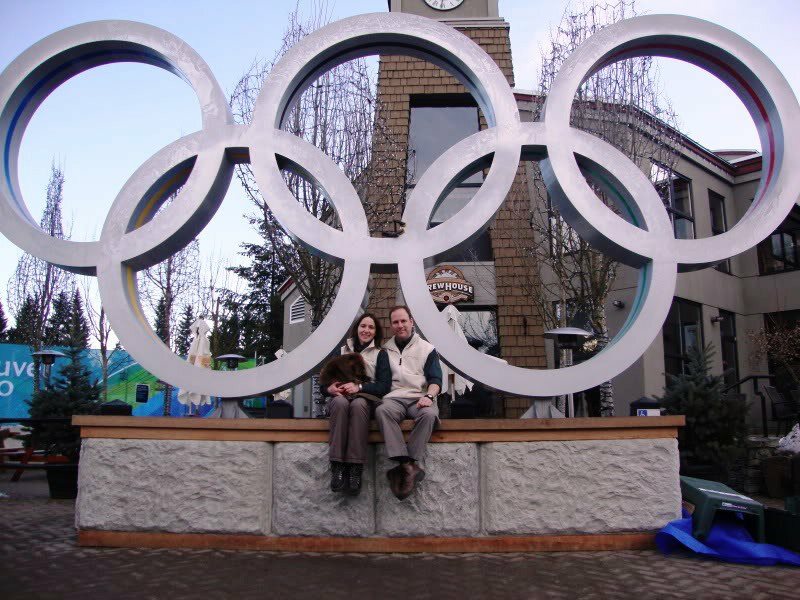 Mr. Boyer was a founding patron of the Muskoka Heritage Foundation and was an honourary patron until his death in 2005.Sadly, his daughter Vicki, passed away in 2004. The award is maintained through the generosity of her children, Johnston and Martha. Richard is a worthy recipient -- he has 'written the book' on the Steamship era in Muskoka. The Steamboat Era in the Muskokas (Volume one and two! ); Port Carling: Hub of the Lakes; Northern Steamboats; Segwun and Windermere are among his published works. He has appeared in several videos/movies on the history of Muskoka (along with cameo clips of both Brian and Nancy in Life on the Edge, a production of the Ontario Visual Heritage Project. If that's not helping to preserve our history, we don't know what is. We've got a Bondi connection to Richard Tatley -- he was instrumental in helping us move our beloved Ditchburn motor launch, Pine Bark, to the Museum of Civilization in Ottawa where she has been refinished, restored and placed on rotating display. So, here is a round of applause for all the award winners, and a special clap for Richard. Well done, all of you. It has been said that Europe has too much history, Canada has too much geography, but you might be surprised by the history we do have, and it is well worth the celebration. Labels: Muskoka Heritage Foundation awards. Richard Tatley. Muskoka. This week I was introduced to a tree. Not just any tree. This tree, which looks like it walked out of the Lord of the Rings’ Middle Earth, is a yellow birch – a bona fide Old Growth yellow birch. And it’s impressive. It has shed a lot of the crown, over the years, but it was still hanging onto leaves when we walked up to it. Yellow birch are slow-growing long-lived trees mostly found with other hardwoods and conifers on moist well-drained soils. It is an important source of hardwood lumber and a good browse plant for deer and moose. Other wildlife feed on the buds and seeds. People are often taken aback by how old Old Growth trees can be. I certainly was. Maturity is normally reached in 120 to 150 years in unmanaged forests. Yellow birch trees are commonly more than 300 years old and occasionally reach ages of more than 366 years. There’s one on record in Algonquin Park that is verified to be 366 years old. Another that is estimated to be over 600 years old. Six hundred... that means when this vast tree was getting started, a tiny twiglet in the Algonquin forest litter, Joan of Arc was being born... Henry V was defeating the French at Agincourt... Dutch fishermen were developing drift nets. It’s astonishing to think of the sweep of history that has marched past while this tree quietly grew in the Canadian Shield. It’s a wonder we have any of these trees at all. Mortality of yellow birch seedlings is usually very high, reported to be as high as 97%. And they don’t into the seedling game without due thought to the process: Yellow birches produce seed at about 40 years, with optimum seed production at about 70 years of age. Good seed crops are produced at 1-4 year intervals with limited seed production in the intervening seasons. Seed is disseminated by wind, with most falling after the onset of cold weather. The winged seeds may travel nearly a mile over crusted snow though most end up within an area roughly equivalent to four times the height of the tree. Yellow birch seeds germinate and grow best on moist mineral soil enriched with humus; bare mineral soil and duff alone are unsuitable substrates. However, in undisturbed stands, germination of yellow birch seeds usually occurs on mossy logs, decayed wood, in cracks in boulders and on windthrown tree hummocks. Optimum germination of yellow birch occurs at 59 to 61 degrees Fahrenheit (15-16 deg C). Seedlings require overhead light, crown expansion space, and plentiful soil moisture and nutrients to compete with faster growing associates; conditions found in gaps are conducive to yellow birch seedling establishment. Some shade improves seedling survival. Too much shade has the opposite effect. This is certainly the biggest, gnarliest yellow birch I have ever seen. It could well be over 300 years old. It is quite possible that it was growing while Shakespeare was penning Romeo and Juliet, or Henry V. It is scarred, twisted, decorated by fungus and missing large bits of the crown, but it is still here. Still wearing leaves. Still watching the forest. Still standing. Labels: old growth Yellow Birch. Muskoka. In geometric terms CB:AC=AC:AB or, more philosphically, "the lesser is to the greater as the greater is to their sum." The ratio of these two lengths is called phi. It works out matehmatically at approximately 1.618 and is believed by experts on these things -- which I clearly am not -- to be fundamental not just to the psychology of aesthetics but to Life, Art, the Universe and Everything. Really. You may not have known this (I only learned about it rather recently) but it seems everyone else has been on to it for ages. Stone Age Man used it in the design of his stone circles (which are sort of egg shaped, the length of the long half being ab out 1.618 times the length of the short half). Phi is the ratio of line lengths in any pentagram, the ancient symbol of health and magic. In 1509 Pacioli published a dissertation on phi, De Divina Proportione, illustrated by Leonarda da Vinci. Much more recently, the book and movie The da Vinci Code hinged on this very principle. In the nineteenth century, a German psychologist discovered that a Golden Rectangle (that is one in which phi is the ratio of the width to the height) was the rectangle most of his subjects found 'pleasant to the eye.' You can see this rectangle in window sizes, playing cards, writing paper, computer screens, book covers. The frontage of the Parthenon fits almost exactly into a Golden Rectangle. The Greeks would have calculated this (having first calculated calculations) but it's doubtful if Stone Age Man had a slide-rule handy. He must have copied from nature. 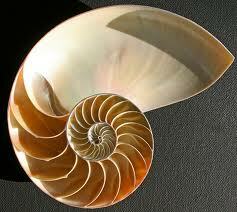 Easy to imagine, since it appears again and again in the natural world, and in the mathematics of growth. You just need to be looking. If you divide any number in the series by the number before, it approximates more and more closely to 1.618 as the series progresses. Take our word for it. Or, closer to home and right here in our garden, the face of a Sunflower -- which in fact is home to TWO Fibonacci spirals -- one turning left, one turning right, both interlaced. It's everywhere in nature, and this little video helps illustrate it. Curiously the presence of this spiral in the ear links up rather neatly with observations about phi in relation to music. If you write the wavelength of sound as a number (Middle C, for example, is 256 cycles per second) then divide this up by various multiples of phi, you come out with what we would recognize as an harmonious progression of notes. Which implies that our instinctual appreciation of music and art, that which we like to call a 'sense of beauty', is simply an inherited ability to recognize mathematical symmetry in noise, as well as in colour and shape. It has been likened to recognizing the face of a friend in a crowd of strangers -- there are certain constant patterns which you can appreciate (either analytically -- like the Pythagoreans -- or recognize -- as Stone Age Man may have done -- from the recurring designs in nature, astronomy and the human form. In other words aesthetics is not a highbrow thing, nor is it useless or effete. It is an essential component of our psychological ability to create things because it enables us to measure what we've made against the most time honoured blueprints. As we keep re-discovering, effective art and design is not about the shock of the new. What works is the shock of the strangely familiar. All of which argues for the inclusion in our educational system of not only attention to mathematics, but music and art as well. Thanks for the science in this post goes to an old article by Dr. John Collee. Thanks for the sunflower photo that opens the post goes to our very own Sarah. Labels: Fibonacci series. Bondi Village. Lake of Bays. "Weather always looks worse through a window" goes the old saying. Often that is very very true -- although if it's a cold sleety mess out there, the window can well be the preferable medium from which to deal with the weather. This time of year, the rains come. Gordon Lightfoot immortalized it in song, The Sinking of the Ella Fitzgerald, in the line "when the rains of November come early." Southern Ontario has been drenched this week. If you didn't have waterfront property before, possibly you do now... The good news up here in God's Country is that it has not rained endlessly. There have been windows -- both glass and in the time/space continuum that have allowed outdoor activity. Walking the dog (who is all snuggled up in warm clothes having just returned from the Dog Spa looking slim, trim and elegant, but who as a result can feel the chill!) has been possible. The BMD has been hard at it gathering leaves, trimming trees, winterizing cottages. Carol and Sue have been pushing hard to get the fall cleaning done. I've been able to get some work done in gardens. It is, however, indisputably soggy out there. The forecast for the weekend is brilliant though, the sun is still out there and will show its face again! Walking the woods at this time of year requires appropriate clothing choices, true enough, but that's easy done. The rewards are there for hikers -- you can see the 'bones of the land', with the leaves down the Muskoka granite and the shape of the hills comes into its own. There is still late colour -- the oaks are deeply russet, tamaracks are donning bright gold, the beech have gone to yellow and tan. The evergreens are darkly green. Mushrooms, enjoying the damp, have popped up in shades of red and yellow in unexpected places. The mallards are drifting on the bay, considering the trip south, resplendent in full plumage. The young loons are still here too. The deer come back onto the lawns to pillage the apple trees, now wearing coats the colour of mocha coffee rather than their spring fawn shades. It is a beautiful world, in all its seasons. This rain will help recharge ground water supplies -- there are places around the country that are still in long term drought and would welcome this. Until we can figure out how to share it, we might as well figure out how to exist with it. 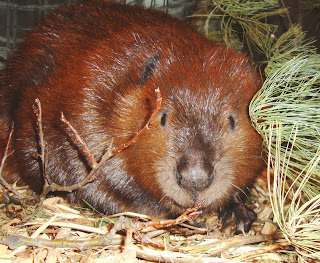 Beavers don't care much for niceties such as culverts, and road construction. They build where they feel like building -- where there is flowing water, and tasty poplars to eat. Up at Damalot, some of the beavers have moved upstream, and that has caused problems. 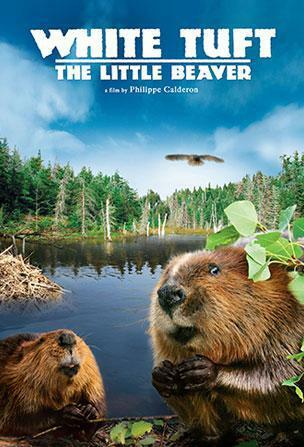 Bigger problems for the beavers, it turns out, but problems all the same. They plugged up the culvert at the Oxtongue Craft Cabin. Now that's a feat, because it was, at least in theory, 'sleeved' with mesh to prevent that very thing from happening. Beavers don't pay much attention to things like preventive measures, either it seems. Jim says he's never seen the stream so 'backed up.' He has waterfront property all of a sudden, as the beavers drown the trees to form a pond. Problem is, the Roads Dept. is not impressed, and is taking rather drastic measures to prevent the beavers from causing the Fox Point Rd. to wash away. In the meantime, we're just watching the waters rise. We're also keeping an eye on our "Christmas gift" -- that gorgeous wind sculpture of a blue heron in flight. I've had an acquisitively desirous eye on that since last year, and am a bit surprised that none of you have leapt in to buy it for me. Yet... I live in hope. 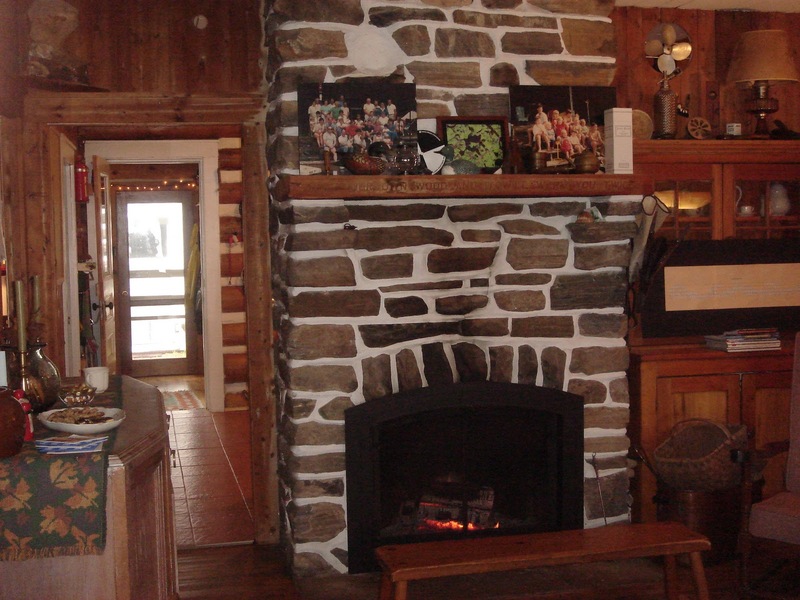 If you're looking for truly unique and beautiful gifts to put under the tree, The Oxtongue Craft Cabin is your place to shop. Labels: Oxtongue Craft Cabin. Bondi Village Resort. Lake of Bays. Beavers. Today was the Dwight Lion's Club annual autumn Road Clean-Up. Brian, Dave and Mike were out to help. I'd say to Pitch In, but since the whole reason the Lions were out there was because people driving along had failed to Pitch In and had instead Pitched Out, the phrase doesn't flow. On the way, I had to pull over for green flashing lights -- these indicated Volunteer Firefighters, and sure enough, local Fire Chief Garry zipped by me into the Firehall. Moments later, the First Response truck was rolling. It never fails to amaze me, that every time that siren goes it means our friends and neighbours who serve on the volunteer Fire Dept have stopped what they were doing and gone to aid someone else. The Fire Dept. is currently looking for more volunteers to join their ranks -- you might consider it, if you live in the region. And Bob, well, he pointed out that it's not all trash -- he had found an American dollar bill down in the ditch. Not enough to solve their credit crisis, perhaps, but proof that at least some US money stayed in Canada this summer. So here's to the volunteers, be they responding to a fire, a medical emergency, helping run kid's programs, serving on committees, running fundraisers, or picking up the trash. Communities run on Volunteers. You ROCK. Labels: Dwight Lions Club. Lake of Bays Fire Dept. Lake of Bays.